I’ve been reading and thinking about verse novels lately, and the way that lots of smaller poems can weave a narrative. So, for Poetry Friday today I thought I would share the opening poem from my own verse novel, Pearl Verses the World. With just a single coconut tree. Floating aimlessly through a void. This poem came to me late one night as I was getting into bed. I grabbed a piece of paper and jotted it down. It was only later that I realised that this wasn’t only a stand-alone poem – it was the start of a story, a story which insisted on being told. And so it evolved into a verse novel. At the start of this book trailer (which was my first ever attempt at such a thing) you can hear the poem read aloud, by Murphlet 6. Ever since that poem came to me, I’ve been really grateful that it chose me – and that Pearl, the voice in the poem, chose me to tell her story. The book has been published in Australia, the United States and England (under the title Pearl) and was made into a play by the Jigsaw Theatre Company. Most importantly, it’s been read and loved by children and by adults, some of whom didn’t even realise that the book was poetry – which is fine by me (I call it poetry by stealth). What was the last verse novel you read? If you’ve never read one, maybe it’s time you tried one for yourself. Happy Poetry Friday. Today’s roundup is hosted by Beyond Literacy. Aw, Sally, what a lovely book this looks to be, both the writing and the illustrations. I enjoyed your trailer! Enjoyed hearing about your book, Sally! I love verse novels and look forward to reading about Pearl. Thanks Jama. Verse novels became my passion from the moment I first read one. I love spreading the word about them. Sally, Pearl has a beautiful voice that is filled with positivity. I am delighted to have read this post and listened to your video. Verse novels are filled with wonder and craft and perhaps one day my attempt at personal poems will lead to a character who calls to me. Thanks Carol. I look forward to one day reading a verse novel by you. Did you get to see the play when it was performed? Thanks Tabatha. Yes, I was flown to Canberra to see the play. It was amazing to see my character brought to life so convincingly. Love that your cat is called Pearl. 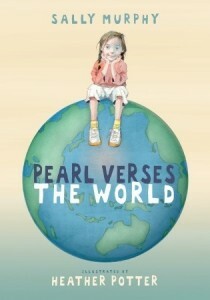 Yes, Pearl is a lovely verse novel–nice to see this poem today! I read as many verse novels as possible–a recent favorite is Somewhere Among, by Annie Donwerth Chikamatsu. Thanks Holly. I haven’t read Somewhere Among. Will keep a look out for it. I love your daughter’s voice reading the poem. Great trailer. I love the picture of the ladies in the pool. I’ll look for it. Thanks Brenda. I’ll let you in on a secret – it’s actually my son reading. He was about 8 at the time and wouldn’t be able to carry off the part now that his voice is deeper. I have a whole shelf of verse novels in my classroom, but I haven’t been able to tempt kids into falling in love with them…yet! Next verse novel I’ll read is Falling Into the Dragon’s Mouth by Holly Thompson. Glad to hear there in your classroom Mary. I find most kids love them once they start to read them and/or have them read TO them. Often it’s being told they are poetry that can make them threatening. If they simply come across them amongst other novels they don’t always realise they are poetry, and the white space can make them appealing, especially to reluctant readers. And such a beautiful verse novel it is, too. It mayhaps even helped me find my own voice… a number of years later. I still recommend it – and revisit it. And cry… But I had never heard that story about your start point. Thank you Kat. I still have the bit of paper I jotted the first version down on. It is close to identical to the final version.